It's time to right some wrongs, one MVP at a time. It's been tougher than a $4.99 steak. Got chased by Dobermans eight times. Had to hire five different sticky-fingered third-graders. Broke into the wrong house twice. But it's finally done. I've been able to retrieve every single MVP award that was wrongfully won by every single suspected 'roid ranger over the past 20 years. You can see them all shining on the table next to me. Got the stains off them and everything. Now I'm ready to give them to their rightful owners. And why not? If Bud Selig can talk about giving Barry Bonds' phony-as-tofurkey home run record back to Hank Aaron, why can't we right all the wrongs of the Syringe Binge? THIS IS HISTORY WE'RE MAKING HERE. JUST DON'T LET US DOWN ON THIS THING, ALBERT. Let's start by bringing former Red Sox Mike Greenwell up to the podium. Greenie lost the 1988 AL MVP to Jose Canseco, who admitted in his book, "Juiced," that he cheated worse than Rosie Ruiz that year to win it. Canseco even told Howard Stern that Greenwell, now a high school coach in Fort Myers, Fla., "should stop by the house" to pick up the award. No need, Mike! Here it is. Should look sweet on the mantel. "Man," Greenwell said when I called him. "I guess I'll just say it's been a long time coming. I even remember telling Jose once, 'Man, I'd love to have your power.' And he said, 'Come to Miami and I'll hook you up!' But I never did." "My wife and I were trying to have a baby and she basically said if I went on steroids, she'd kill me." Now he's got two boys. Healthy ones. Step up here, Mike Piazza. The late Ken Caminiti of the San Diego Padres stole your 1996 NL MVP, then admitted he was into more juice than Jack LaLanne. Yes, it's 13 years late, but the nameplate is new! And here's yours from 2001, Luis Gonzalez, after you finished behind The Barry Bonds Pharmacy. We won't even mention the home run title you would've won that year. Now, for the man of the night. 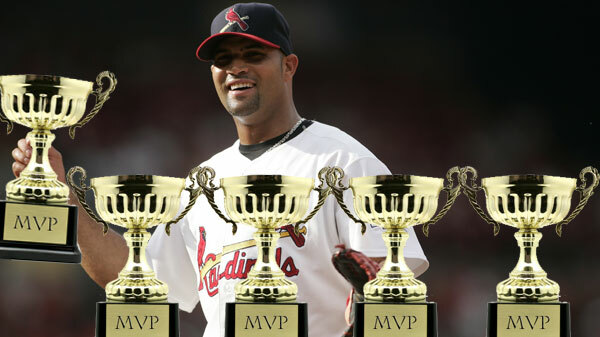 I have a U-Haul of hardware here for Jose Alberto Pujols Alcántara of the St. Louis Cardinals. You already have two MVPs, Albert, and you're about to get three more, since Barry Bonds ripped you off worse than Bernie Madoff to win the award from 2002 to 2004. You hit .335 and averaged 41 bombs those years and yet you finished second behind the clearly creaming Bonds in '02 and '03, and third behind Bonds and Adrian Beltre in '04. We're throwing out Beltre since, while he denies ever using PEDs, he fell off the face of the planet once baseball put in stricter steroid suspensions in 2005. If he wasn't cheating, I'm the Queen Mother. And this is history we're making here. It gives you five MVPs, and nobody else in baseball history now has more than three. Just don't let us down on this thing, Albert. You know what we're talking about. Speaking of letting people down, Alex Rodriguez admitted last week he cheated like a Three-Card Monte dealer from 2001 to 2003 as a Texas Ranger. He was the AL MVP in '03, stealing it from then-Toronto Blue Jay Carlos Delgado, who finished second. Just to recap: He cheated. He admitted it. He won the MVP. And yet the people who gave Rodriguez the award— the Baseball Writers' Association of America—decided last week that he could keep it. "It's [A-Rod's] award to do what he wants with," BBWAA secretary-treasurer Jack O'Connell told a reporter. "Listen, the wool was pulled over all our eyes. We had an election and those were the guys that won. The awards are theirs." Thank God O'Connell isn't a judge. Yes, you admit you robbed the bank, but what the hell, why don't you go ahead and keep the cash? Buy yourself something nice. "The awards are theirs"? What is the BBWAA motto: Tread on Us? Shame on O'Connell and every writer who agrees with him. These people let this whole Rage Age go down right in front of their notepads—left it up to Canseco to break the story—and now they're rewarding them? Coddlers. So step right up, Moises Alou, here's your MVP for 1998, when you finished behind Sammy Sosa and the Dubious Dinger, Mark McGwire. Here's yours for 2000, Frank Thomas. You were fleeced out of it by admitted 'roider Jason Giambi. There you go, gentlemen. Please accept our belated congratulations. And don't make us regret this later on. Remember, we know sticky-fingered third-graders.